With a special combination of biodegradable ingredients, including natural bacterial cultures and fermentation extracts, Catit BUST-IT Urine Buster is specially formulated to tackle stubborn cat urine stains and odours from all types of surfaces (carpets, upholstery, ceramic, tile, wood floors, etc). It even works on porous or damaged surfaces. It is also excellent for removing other types of pet stains and odours caused by organic matter (faeces, blood, vomit, etc). 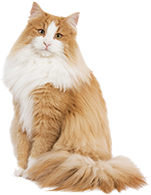 Catit BUST-IT Urine Buster is certified under the EcoLogoTM program for its environmentally-friendly nature. 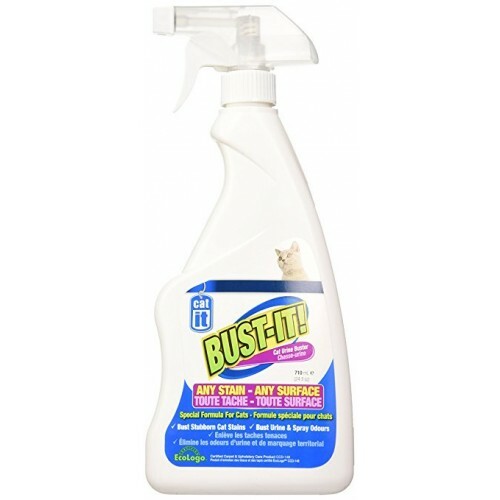 Catit BUST-IT Urine Buster, 710mL (24 fl oz) spray bottle. The environmentally-friendly product, no harsh chemicals or fumes, specially formulated to remove urine stains & odours. Also works on other types of pet stains and odours. Lightly brush the area with a brush or clean cloth using a circular motion, working from the outside of the stain towards its centre. As necessary, rinse the treated area with clear water and absorb water excess. For carpets, upholstery, etc., vacuum area after it dries to remove any potential cleaning residue.